Quid, bucks, pesos...whatever you call it, it seems that everyone thinks they need just a little bit more. As for Israel, flocks of recently-released soldiers go to the U.S.A. every year to work in malls and make whatever money they can so that they can come back to Israel and spend it on items that are priced incorrectly. You see, in Israel the pricing doesn't match the currency. Israel's currency is the shekel, which is made up of 100 agorot, just as the dollar is made up of 100 cents. However, unlike in America, Israel has discontinued the usage of any agorot coins except for 10 and 50. This would seem to work fine, except for the fact that pricing has not reflected the change. Since you cannot possibly pay 9.95, and a store cannot possibly give you 5 agorot back if you give them 10 shekels, the store always steals form you. This evening, as my roommate and I were getting ready for melave malka (the meal after Shabbos), I opened the (newly re-installed) refrigerator to find that he had also purcahsed the same chumus as I had, only his was priced 4.95 and mine was priced 4.99. I wasn't sure if I should feel bad that his cost 4 agorot less, or happy that the store stole 4 agorot less from me in the end. This Shabbos, as I ate lunch with my roommate by the amazing Novominsk couple down the street, the husband (a man who is as religious, but probably as hip, as one can get) turned the conversation from the usual topics of Dire Straights, Pink Floyd, Led Zeppelin, jazz, and yarmulke-wearing-women, to a strong statement brought out from this week's parsha. In parshas Vayikra, the Torah portion read this Shabbos, outlines are given regarding the types of korbanos (offerings) that are to be brought, as was addressed in the previous post. When dealing with the korban olah, the "burnt offering" (which actually means "elevated offering" and not "burnt offering"), we are given three ways of giving the korban. First, if a person is of substantial wealth, they are to offer something from their flock of cattle or sheep. If they could not afford this, they could bring doves. For the poorest people in society, the offering was made from flour and oil. Because the latter offering, the korban mincha, is form the depths of the person, mefarshim (commentators) make it clear that this is an offering that is more dear to G-d. According to the Chasam Sofer, the poor person is not easily able to offer the korban mincha. First of all, "poor" in their sense is not simply low income. These were people who completely depended upon the Torah obligations on society in order to survive. Therefore, the flour was made by the people who gave the korban mincha. This means that they had to harvest the wheat on the corners of the field (which the Torah requires be left on all fields for poor people), then worked in their home, and the same with the oil. For a poor person, their offering was extra work, and took out of their vital food storage. Because it required so much effort, eventhough it was not what others might consider "top notch", this is why it was so dear to Hashem. My host continued by saying that Chazal offers a warning to those giving korbanos, that they should be sure to have kavanah (intention) when giving them. Many have understood this to mean that the poor person, while doing so much work to present the korban, should not be diverted by the work, but should remember to have proper intention. However, the heiliger Kotzker Rebbe zt"l says that this is a warning for the wealthy person. If you are poor, and you korban takes so much effort, how could anyone believe that you wouldn't give it with the proper understanding, and even deeper personal meaning? For the wealthy person, who walks down the main street with their fattest cow on the way to offer such a wonderful korban, the Kotzker Rebbe says that they are the ones who need to be reminded of the real meaning behind the mitzvah. My host offered another interesting, amazingly powerful vort on this. Based on the Torah, for a wealthy person (who is able to give of the choicest animal in their flock) to give the korban mincha (like a poor person) is not only inappropriate, but mocks the entire system and is an aveirah (grievous misdeed). The Chofetz Chaim draws a parallel with what we commonly view as replacing korbanos: tzedakah (charity). 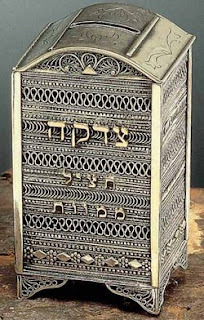 For a poor person to give even the most basic, tiny amount of tzedakah, Hakadosh Baruch Hu takes great pleasure in this. However, when someone has the ability to give large amounts of charity, yet gives only a little, they are not only failing to do what they could, but they are doing an aveirah. This, as well as the related example with the animals, is because Hashem gives us everything for a purpose, and that purpose is to use it to elevate the world. As he finished giving over this last vort, he looked at me and said, "I mean, this wasn't even coming from a Chasidishe Rebbe! It was the Chofetz Chaim! What a vort!" What a vort indeed. Nice post!!! glad you had an good shabbos! Yes, it is correct that the state of Israel needs to be changed in many many ways. But that is not a reason not to support it. I had a discussion with a friend of mine today who supports the democratic party, yet does not agree with ALL of its policies. The same should go for us, who have no real place beside Eretz Hakodesh, support something that can IY'H turn around to a Torah abiding state. When people start to realize this, this state will start to change for the better. Bsoros tovos!